New With Tags Girls Elf Yourself Gray Sweatshirt Elf yourself with this cheery Glam Girls sw..
New With Tags Gilrls Sweatshirt with a festive and cheery pug wearing antlers. Cotton.. 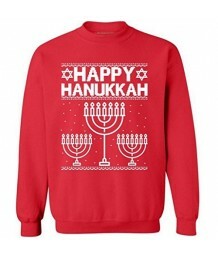 Happy Hanukkah Sweatshirt Super Soft 80% Cotton, 20% Polyester ..